Daniel Smith watercolor sticks are a new product created by Daniel Smith Art Supplies and available through no other companies or distributors at time of writing. There may be some stores or online stores that carry Daniel Smith products, I just haven't found them. Daniel Smith Watercolor Sticks are artist grade pure watercolor in stick form. All colors so far have lightfastness 1 (top by their scale) and containing intense pigment saturation in a fairly large stick about 3" long and 1/2" wide. They were introduced in 2008 in a set of six or individually for $12.49, a steep price. The current range is up to 21 or 22 colors total. I have 13 colors total and two duplicates for a total of 15 sticks. I tried them in order to use them like oil pastels or watersoluble art crayons and must report -- these don't work very well for that purpose. I have so many of these Daniel Smith watercolor sticks because they work so very well as a portable form of watercolor, similar to watercolor pans except that you can draw with them on damp paper. On damp paper, the line is very bold and rich. 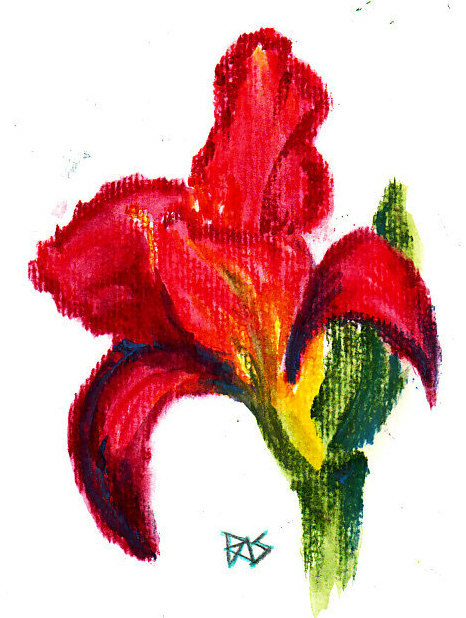 The color dissolves instantly, much faster than with most watercolor pans. Daniel Smith watercolor doesn't even come in pans, so this is more like their equivalent of pans than anything like oil pastels or oil sticks. They're worth the money for how concentrated and high quality the paint is. It is excellent artist grade watercolor, right up there with the Daniel Smith watercolor tubes or Winsor & Newton. It's just that used dry on dry paper, the mark is going to be faded and crumbly with little specks sticking but no clear strong mark. 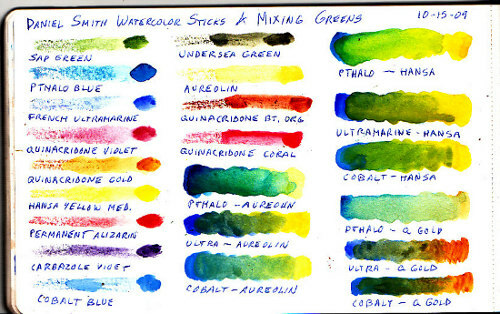 Below is a color chart showing different effects in my Moleskine watercolor journal. The start of each line is dry on dry, then I washed over the dry line for a better effect. I have yet to get the trick of using them dry on dry effectively, they have a very different texture from oil pastels or wax crayons. Then I touched a wet brush to the stick to paint with it for extremely intense effects. So you can see why this isn't anything like oil pastels, just a really handy, colorful, intense and versatile type of transparent watercolor. The beautiful drawn effects in the Peacock Demo that Daniel Smith puts on their catalog and site drawn and painted with Daniel Smith Watercolor Sticks were produced dry on wet. That will give a strong, dramatic line just the way it will if you use watercolor pencils. I was very happy with the effect of using them dry on wet paper, they give a strong soft-edged line and the color is fantastic. If you are considering investing in Daniel Smith Watercolor Sticks, the company has several trial sets available -- two-for-one trial sets, and a $25 secondary colors triad available at time of writing. I've been watching for them on specials and also got a coupon for buy five, get one free plus free shipping and a plastic case that holds five of them. So watch the site and catalog for deals and specials. Sign up for their email specials, they often run short term coupons, discounts and free shipping offers. Like certain other products including most Caran d'Ache ones, this is an expensive art supply that's cost effective when you can afford it -- and well worth bargain hunting for their specific sale items. 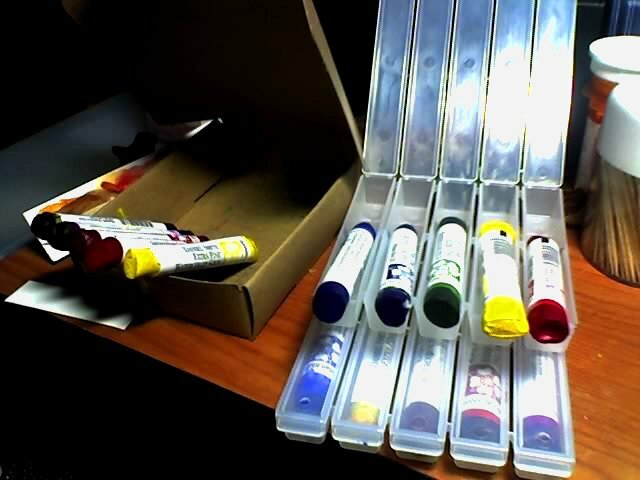 They pack a lot of pigment into a very small portable package, much more than watercolor pans. Consider buying watercolor sticks with a friend in different colors, cutting them in half and sharing so that you both get all the colors - they're so concentrated that you'll be using a half stick for a long time before needing to replace it. Daniel Smith doesn't actually put their watercolors out in pan sets, so these sticks are the best way to get a portable travel set and do dissolve much faster and easier than any pans I've ever tried. It's real innovation, just not an adjunct to an oil pastels palette other than for underpainting. Despite not being able to use them dry, I keep collecting more colors because in watercolor I do love using pan sets and portable sets. They fit easily in the pockets of my pocket-vest, using a waterbrush I can do immediate sketching and when I use them dry on a wet piece of watercolor paper, the bold effects pleased me. Below is a sample artwork done dry on wet with these watercolor sticks on 90lb cold press watercolor paper.